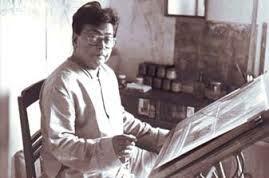 Ganesh Pyne, the famed contemporary Indian painter, passed away at a private hospital in Kolkata on Tuesday, March 12. He was 76. Born in 1937 in a large family of North Kolkata, Pyne spent all his life in the city that so enchanted him. He is widely acknowledged as a leading second-generation Indian modernist. Succeeding the early pioneers, such as M.F. Husain and F.N. Souza, his cohort was the first to be trained in post-independence India.